Hello, after the release v2.4.0 Nuxt has TypeScript support. Is there any example of implementation TypeScript Express and nuxt? It is not clear to me how to use TypeScript with express-template, particularly on server side, because express-example uses nodemon and requires nuxt.config.js in server/index.js file. Since Webpack 4, there seems to be an issue with this project. I've been following the documentation on the readme. When running npm run dev an error about eslint-loader is showing. It seems nuxt is still installing Webpack 4 and leads me to believe its throwing all the dependencies into version warns and out of whack. But pussyfooting around with more errors. Theoretically this should just work, right? I tried to run this template on Azure Web Apps. I found that the issue is caused by the Web Apps architecture (e.g. using iisnode and Named Pipe, and restriction of connection to 'localhost' ). Especially, named pipe (and unix pipe) is not supported by latest(1.4.2) of nuxt.js. It will be supported from this commit of 2.x. Do you have any plans to change version of nuxt.js? horihiro/nuxt.js is forked from v1.4.2 of nuxt.js to add support of named pipe. 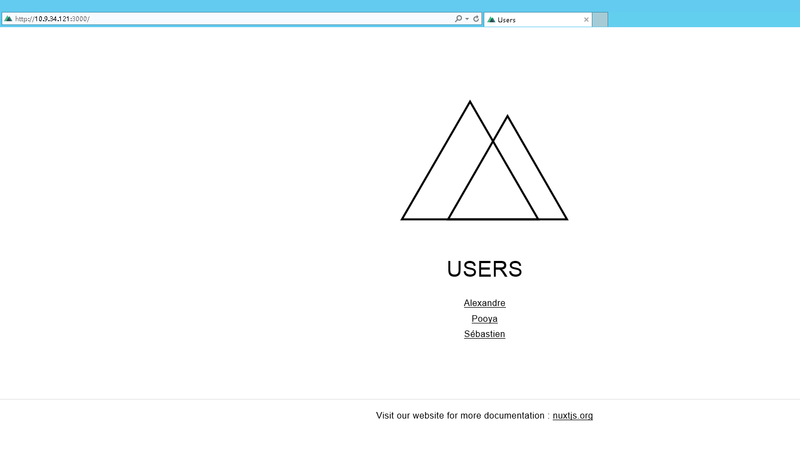 horihiro/nuxt-express-azure-webapps is generared by this template, and is added some commits to run on Azure WebApps. I am using nuxt-edge with express server via nuxt.config.js serverMiddleware and I want to use aliases (~, ~~) in imports in the same way as on the frontend (e. g. in vue templates). Is it even possible to use them? Because in this repo they are not used https://github.com/nuxt-community/express-template/blob/master/template/api/index.js#L7. If I use alias, the nuxt throws an error Cannot find module '~/router/router'. for authentication on the server, I'm using passport and express-session. After updated the app to use the new approach of setting server as serverMiddleware, now the nuxt app don't have access to req.session or req.isAuthenticated(). Basically it don't have access to server req object and for checking if user authenticated, I've created an api endpoint and in the nuxtServerInit, sending an api request and getting user object. Other stuff like accessing authenticated router endpoints on the server is working perfectly. After lots of googling, was not able to find any solutions. Not sure if this is issue or does it suppose to be like that. Note: The README is still not updated for the latest changes. For example it still mentions backpack have been used, but it is removed. Could example to use Mongodb in this? When using this template (and this code below in the API folder, does it completely ignore the nuxt.config.js file? I am running express with Nuxt and it seems this is the case. The config file is completely ignored. I have used nuxt.js in my project, use nginx as the proxy, but there is a problem，when the amount of visits is very large, 504 errors often occur. # init the project with express-template, the lastest. The result is that nuxt.js based vue-ssr is very slow, the Jmeter Throughput is just 320/sec. Is there something wrong with my benchmark or something what let nuxt.js slow? Need some help!!! I try to use this template but, while instalition i cant sind folder 'server'. What is the reason ?